SEVENTH GRADE VS. THE GALAXY: It's a Map! My very first on this site. And I can think of no better occasion for it than today, EXACTLY THREE MONTHS before the launch of SEVENTH GRADE VS. THE GALAXY, my middle-grade sci-fi book coming out on March 5, 2019 from Lerner/Carolrhoda. Have you seen the cover? Probably. But what’s one more time between friends? But I know, I know, you’re not here to be bludgeoned with the cover—you’re here (maybe?) because I hinted on Twitter that you could get a behind-the-scenes glimpse at one of the million things I absolutely love about SEVENTH GRADE VS. THE GALAXY: The map/floor-plan of the school. You see, a lot of the book takes place in the future, onboard the PSS 118, this old, rundown, “Public School Spaceship” orbiting Ganymede (one of Jupiter’s moons). Like any typical school, the PSS 118’s got classrooms, a gym, a cafeteria, a library, fusion reactors, and artificially intelligent lunch robots. That’s all pretty typical, right? 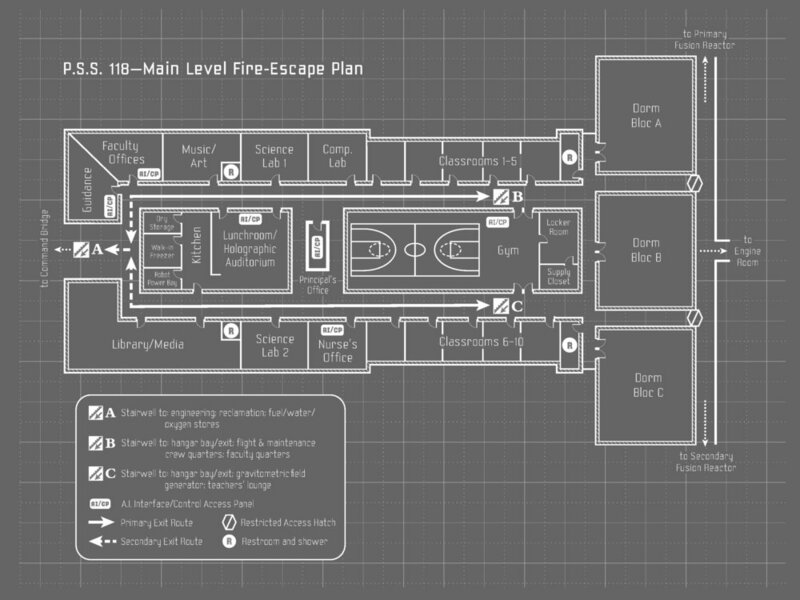 When my editor at Lerner told me they were game for including the school’s “Fire Escape Plan”—which is mentioned in the book—I was THRILLED. And I really think it came out great. Take a look! SO MUCH thought went into this design. Which rooms are next to which? (Sometimes mentioned in the book, sometimes not.) How far down from one section to another? How big is a given room? How much dorm space do you need to house 100 5th, 6th, and 7th graders in space? But we had to start somewhere. And that somewhere was my VERY INFORMAL, poorly drawn mockup that I scratched together on a medium-sized whiteboard. Note: I AM NOT AN ARTIST. And I’m DEFINITELY not a Space Architect. (Are there “Space Architects”? There should be.) But still. No bad ideas in brainstorming, right? Did you know that the Virginia Department of Education recommends 11-14 square feet of space per student in a middle school cafeteria if you’re going with “Rectangular Tables with Stacking Chairs”? Well, me neither. Not until I did research for the map, anyway. Something tells me that this is not exactly what the state government had in mind, when they put together their guidelines…But thanks, Virginia! What’s the “more”?! It’s a pre-order of a copy of the final book too. I love my ARCs. But I love the finished product even more. You GOTTA have both! Anyway, as I wrote on Twitter, just Retweet (don’t “Quote Tweet”) the original Tweet linking this post/announcing the contest AND follow. Open to US residents/addressees. Ends December 11, 2018, at 11:59pm. And I’ll have some randomizer Internet robot choose a winner on 12/12. Good luck! And oh yeah. One more thing. Between now and the book launch date (March 5, 2019! ), I’ll keep coming back here to tell you more (no spoilers!) behind-the-scenes stuff about SEVENTH GRADE VS. THE GALAXY. I’m SO EXCITED for kids (and grown-ups too!) to read it. Hope you enjoy!